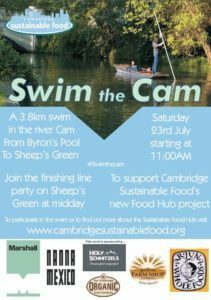 Swim the Cam, CSF’s exciting new challenge aimed at raising money for the Food Hub Project, The event takes place on Saturday 23rd July, starting at 11am. The swim is 3.8 km from Byron’s Pool in Grantchester to Sheep’s Green in Newnham, Cambridge. Experienced swimmers are asked to register by emailing duncan@cofco.co.uk. CSF also needs stewards and other volunteers on the day. There will be a party at the finishing line from 12 noon, with refreshments from the foodPark collective. Read more about Swim the Cam here and more about the Cambridge Food Hub project here. You can sponsor a swimmer or donate to the Food Hub project here. This entry was posted in News on July 12, 2016 by GJ.